There are simply many errors that you can encounter while using a computer running on Windows operating system. While some errors are specific to the OS, others relate to hardware attached to your computer. There are errors that relate to software and applications you have installed. One such error that relates to installed application is error 0x803f8001. It is a cross-cutting error since it also occurs in phones running on Windows OS. Error code 0x803f8001 is an application related error. Although you can encounter it while launching any application, the most likely moment you may encounter it is when launching a game. Indeed, the error message accompanying the error code reads something similar to “Do you own this game or app? (Error Code 0x803f8001)”. There are several issues you are likely to notice when they error occurs. In addition to inability to update installed updates, you may also find it difficult installing any application. When you are not signed in to connect to Xbox Live. If the game or app was downloaded by a different user who has never signed into the game console to connect it to Xbox Live. If the game is not present in the console. After an upgrade of the motherboard. 1.Launch the installed anti-virus/malware program and let it perform a full scan of your computer to address any virus/malware issues that may be preventing smooth launch of the application. 2. Do ensure that your computer’s Internet connection is steady and reliable. You may need to wait for the connection to be steady in case you notice it is weak. Launch the application you launched before the error occurred to see whether or not the 0x803f8001 error is resolved. 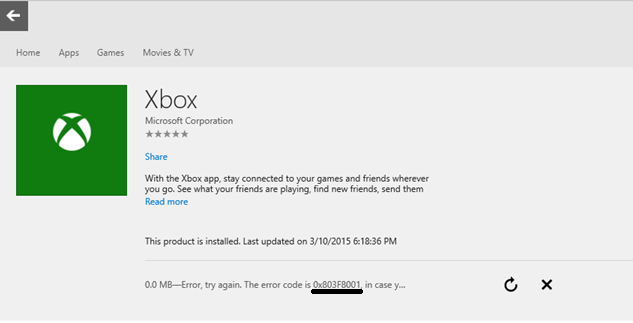 Error 0x803f8001 will automatically occur in a case where the Xbox Live service is stopped. Starting the service easily resolves the error. Check to ensure that all related services are up and running. Launch the application you launched before the error occurred to see whether or not the error is resolved. Performing the simple power cycle routine should be helpful in resolving the error. 1. Press and hold the white button on Xbox One for several seconds to shut down the console. 2. Shut down your computer before unplugging it from the mains for several seconds. 3. Restart your computer before turning the console on. Launch the application to see if this has solved Error code 0x803f8001 for you or not. You may need to restore Xbox One to original factory settings. Note that doing so will erase all settings, accounts and any saved games. Press the left button to open Menu. Scroll down the gear icon before selecting “All Settings”. The Xbox will now be reset. Allow it to sync with the console now and then try to launch again. Most probably this time you should not get xbox error 0x803f8001. Uninstalling and re-installing the app responsible for the error will be your last solution. It is only in very exceptional circumstances that you will need to perform system restore and fresh installation of the OS if the error remains persistent.